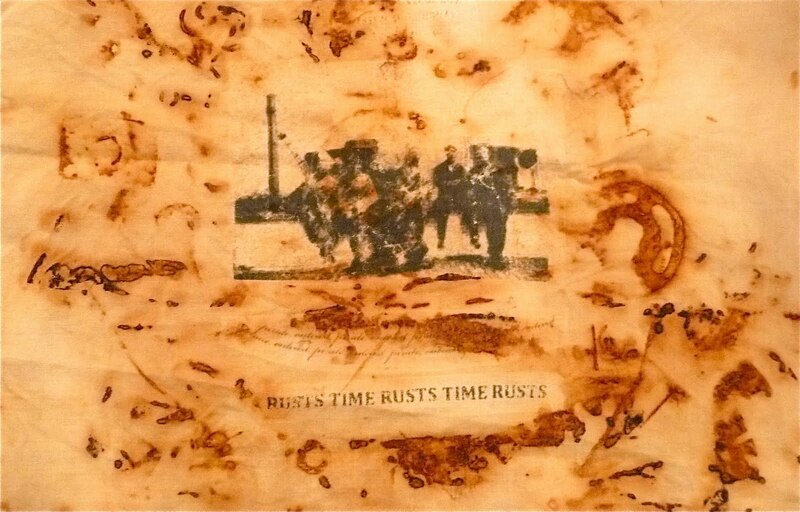 Rust on linen and photo transfer by Flora Doehler. 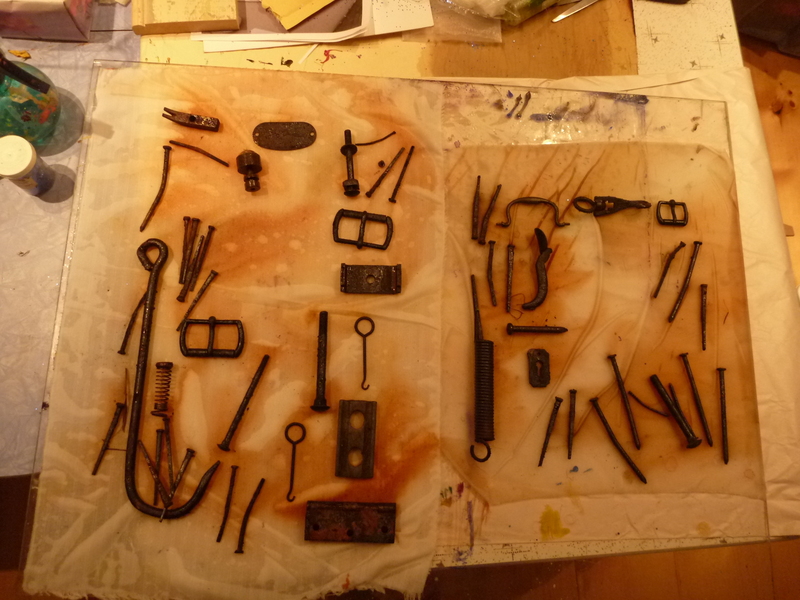 I’ve been experimenting with dying rusty objects onto fabric. Fabric artist friend of mine, Marilyn Preus, used this technique in one of her beautiful wall–hangings and I had to try it out for myself! 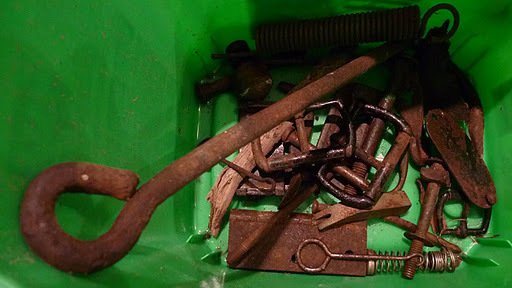 The key ingredient for this is to find rusty objects and we still have quite a few of those in our barn. Thank goodness I didn’t throw everything out when we moved in last year. Suddenly all those funny bits of nails and who–knows–what seemed like a pirate’s booty and I was so glad that we haven’t quite got to sorting things out in the barn. 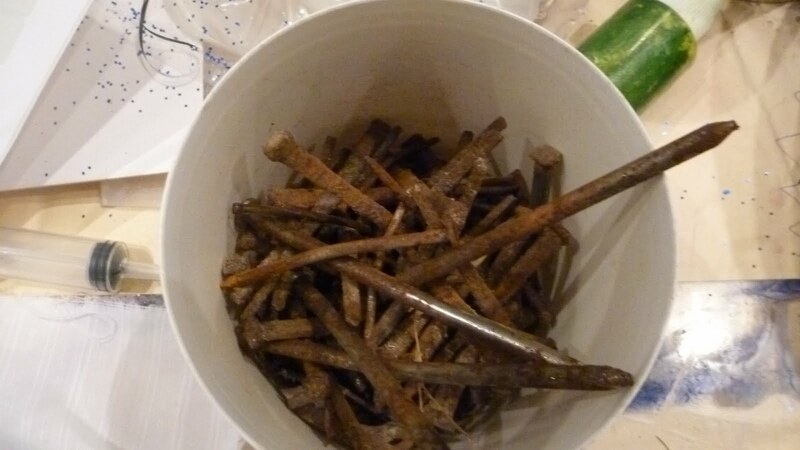 I was also glad that we saved so many of the handmade nails that came out of our house during renovation. They have all rusted at this point and could be used for my project. 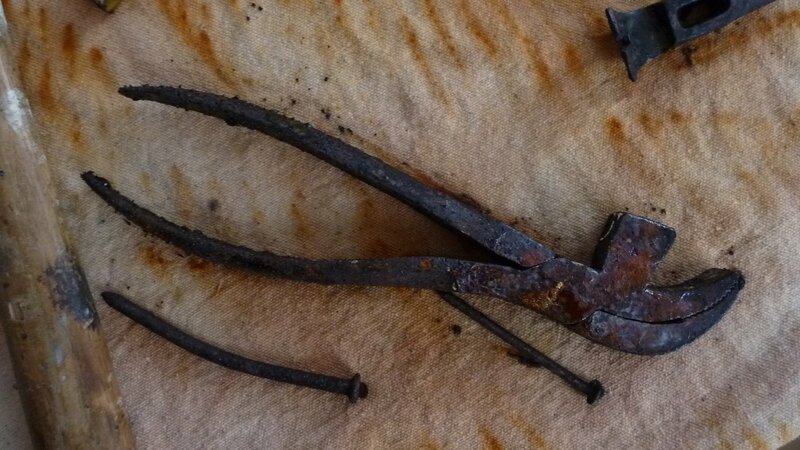 Iron nails that are more than 100 years old. 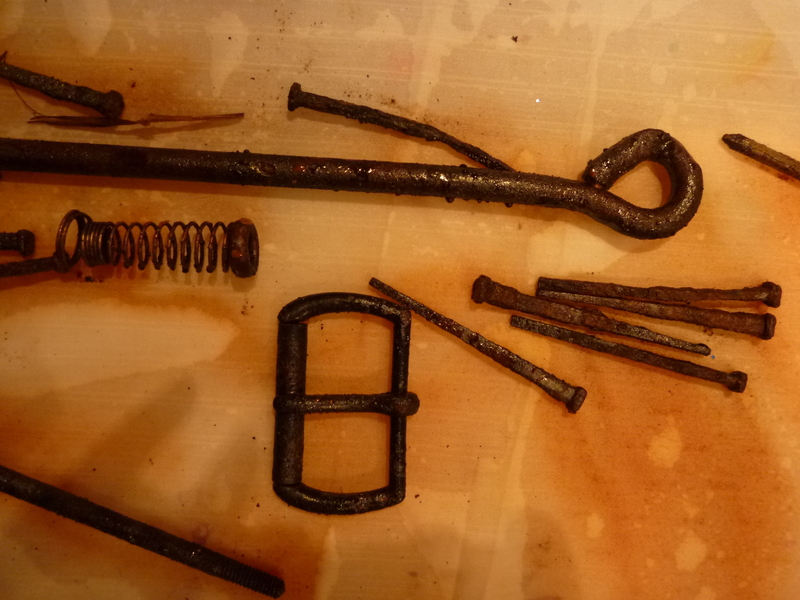 Rusty nails, hooks and buckles. 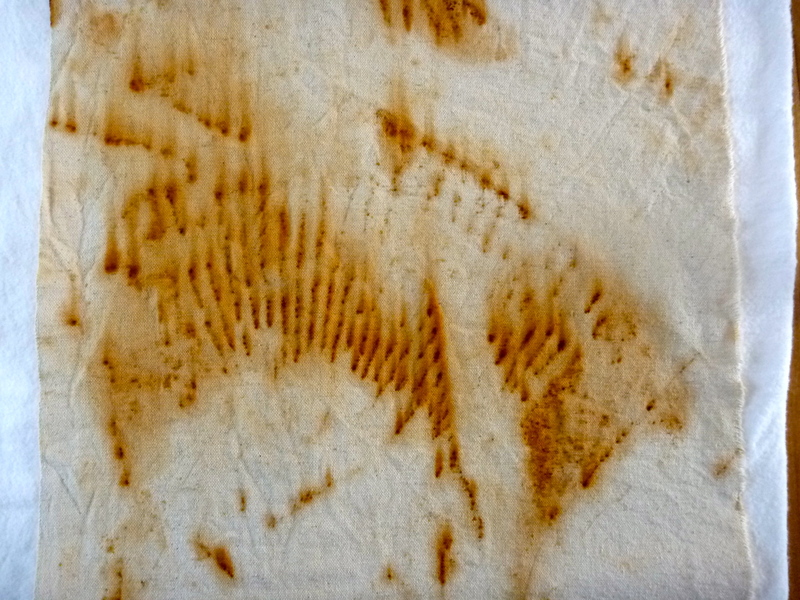 Rust dyeing works best on natural fabrics so I used cotton canvas, linen, and silk for my experiment. 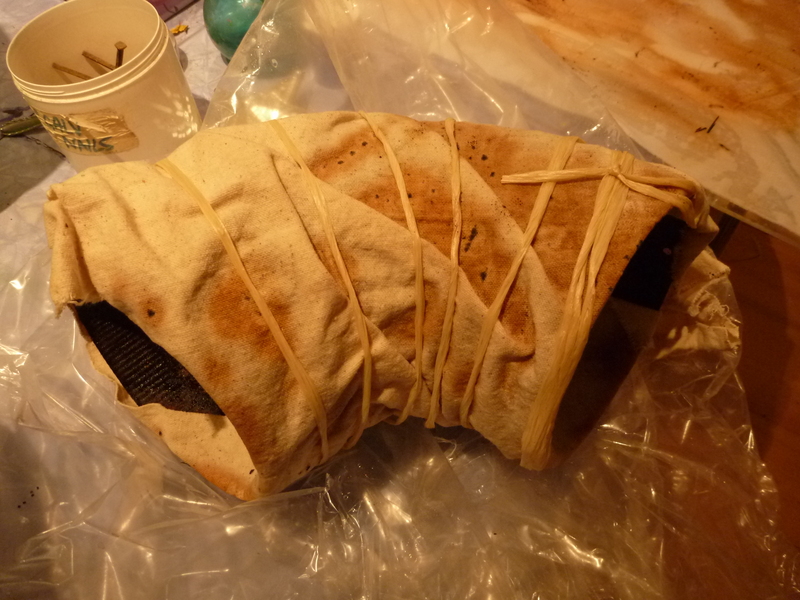 I also tried dyeing a piece of polyester-cotton but the results were very poor. 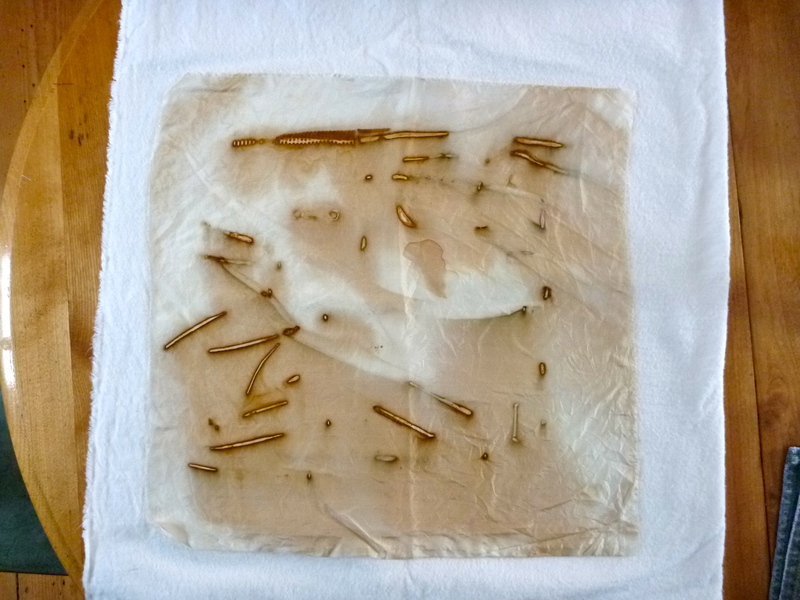 After placing my pieces on the fabric, I squirted the entire pieces with vinegar until the cloth was saturated. 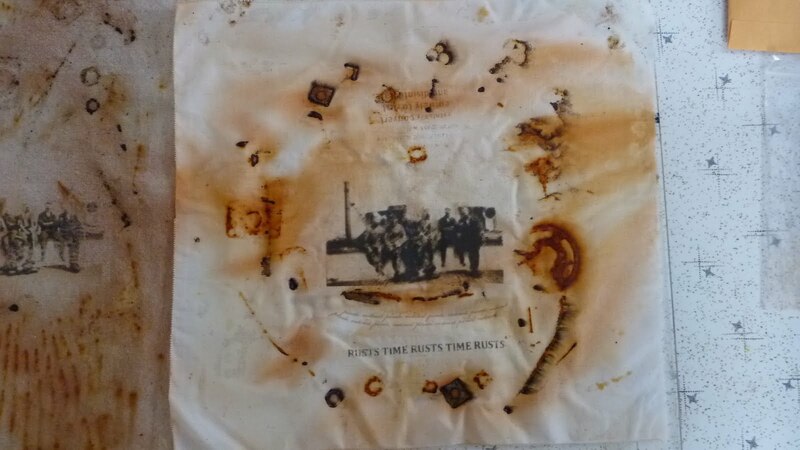 Rusted pieces laid out on poly cotton and silk. 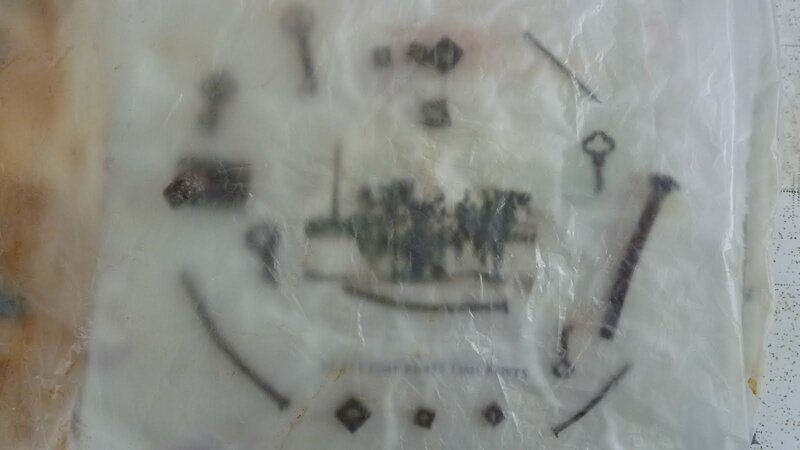 I slipped the plastic board that held the fabric into a large plastic bag and let everything sit for 48 hours. My art room smelled like a fish and chips store for a few days! I wanted to use a ribbed pattern to dye the cotton canvas and I found just the thing in an old wood stove pipe that is resting in the backyard. 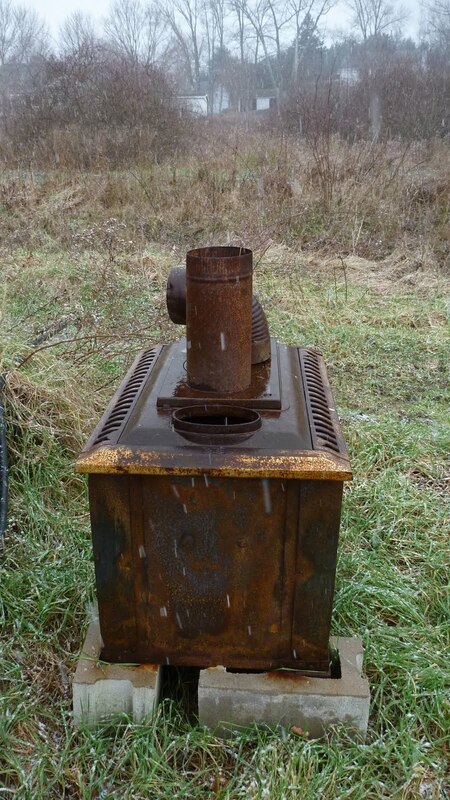 Thankfully this old stove of ours missed the dumpster. I brought the stove pipe into the house, and wrapped the cotton canvas around it. 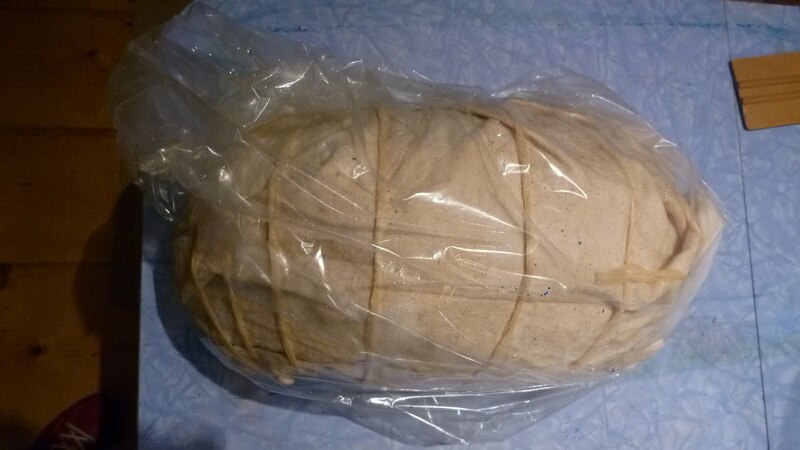 Then I poured vinegar all over it and place it in a bag where it sat for 48 hours. I loved the result when I unwrapped the cloth but unfortunately I washed it before it had a chance to really set so I had to redo my steps again. 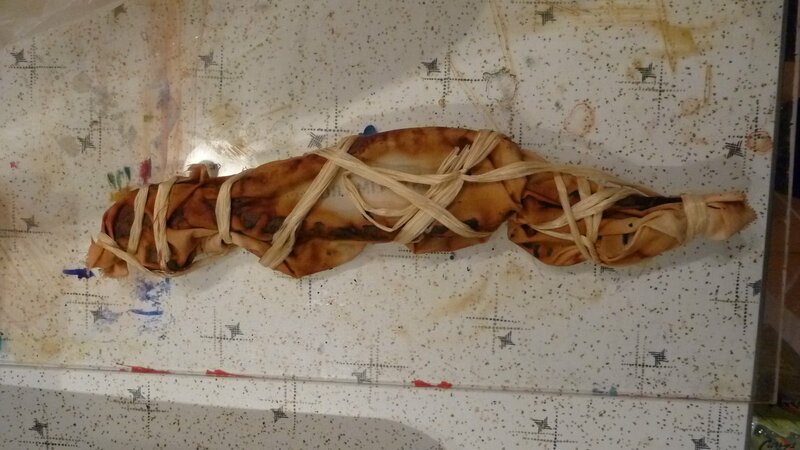 I learned to rinse in cold water and then let the cloth dry and sit for another 2 days before attempting to wash with soapy water. The shapes that the ribbing in the stove pipe made are reminiscent of a birds wing. I am now looking for donations of rusted rebar because I think that would be very cool. 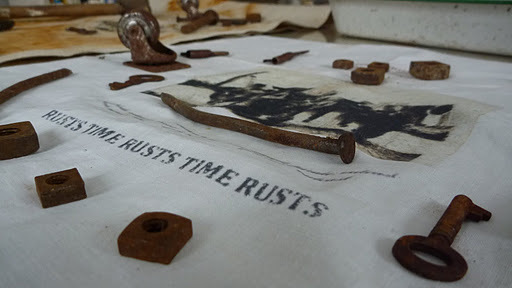 Rust dyed canvas from rusted stove pipe. 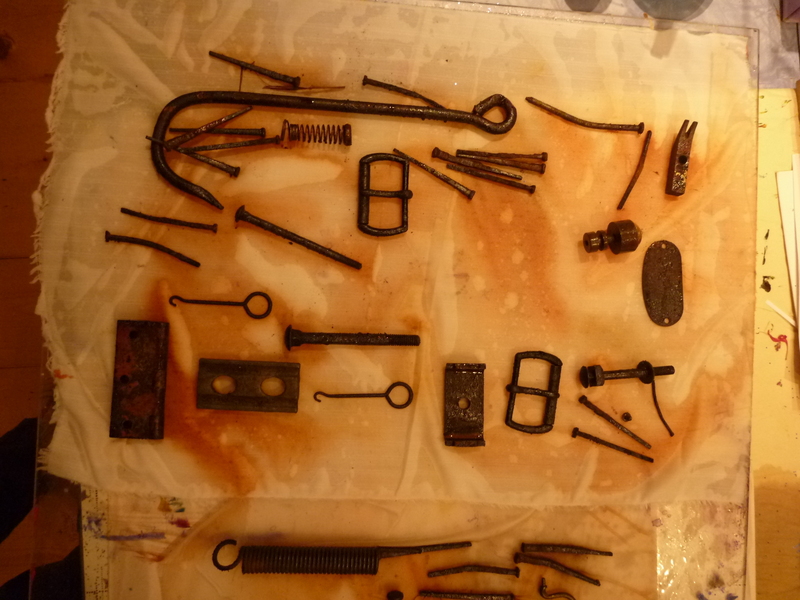 Why this experimentation with rust dying? I am working on a piece for a show here called “Pirates and Outcasts”. This art show will be part of a Bear River Winter Carnival event. Both are wonderful opportunities to have fun in February. I have been working with an image transfer as well. It’s an abstracted photo of young men sailing to this new world in the early 1930s. These men were in their 20s and are probably all dead now. One of them was my father although this isn’t a portrait of him per se. In the piece I create, I want to suggest the impermanence of all our situations as well as suggesting that immigrants are both casting out and are outcasts. I have ideas floating around in my head, but there are still the technical details to master! This piece was on linen and although I liked the placement of the metal pieces, for some reason I had difficulty getting enough rust on the cloth. 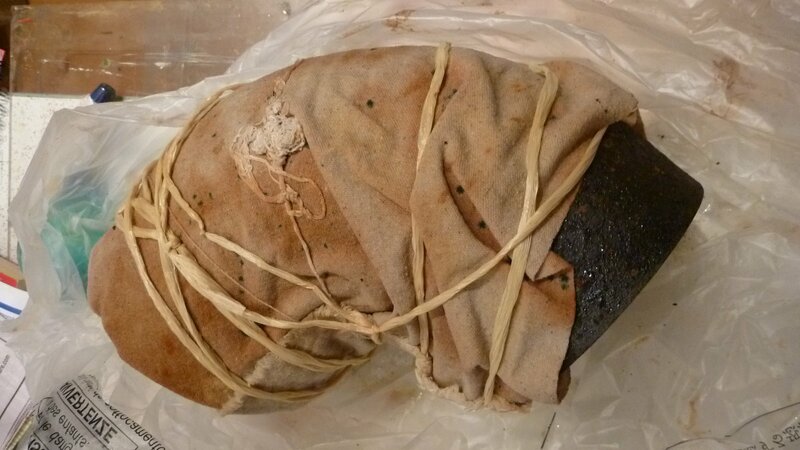 After a couple of attempts I decided to roll up the cloth with those rusty pieces and spray the heck out of it and shove it in a bag for three days! When it was finished it certainly had a lot of rust marks on it! The shapes weren’t as controlled as I would’ve liked them to be and in retrospect I wish now that the photo image transfer had been larger. 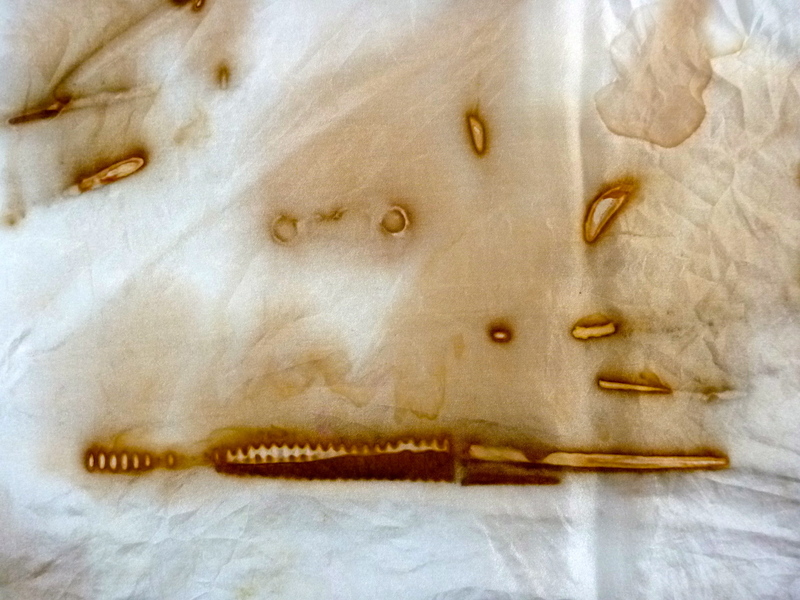 I also rusted a piece of silk and discovered that the most interesting results happened in rusting this piece. Look at the detail in this piece of fabric, especially where the spring was placed. 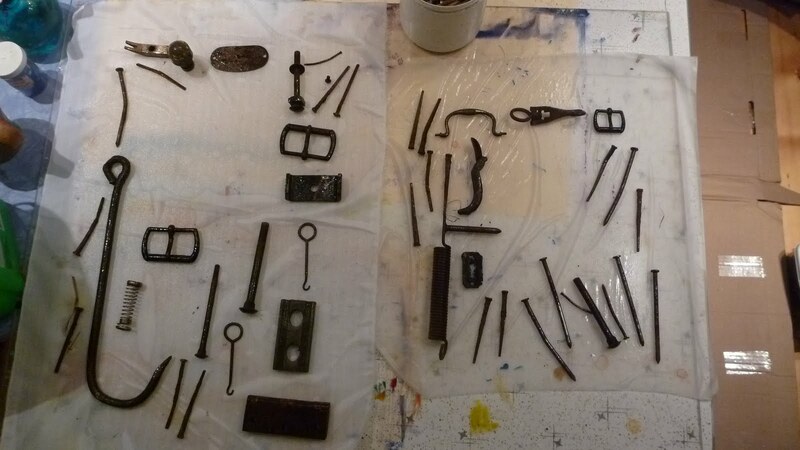 It is back to the drawing board for me or to the rust heap! I am also experimenting with the image of my young men with paint on a canvas which I may show you next… and there is also the landscapes that I continue to work on… plus I just dug out my weaving books and am considering threading the loom again…. so much to do–lucky me! I love the rust!! and the photo transfer too. I will be casting a more discerning eye on the stuff in the basement. Louise D.